And not so hidden. 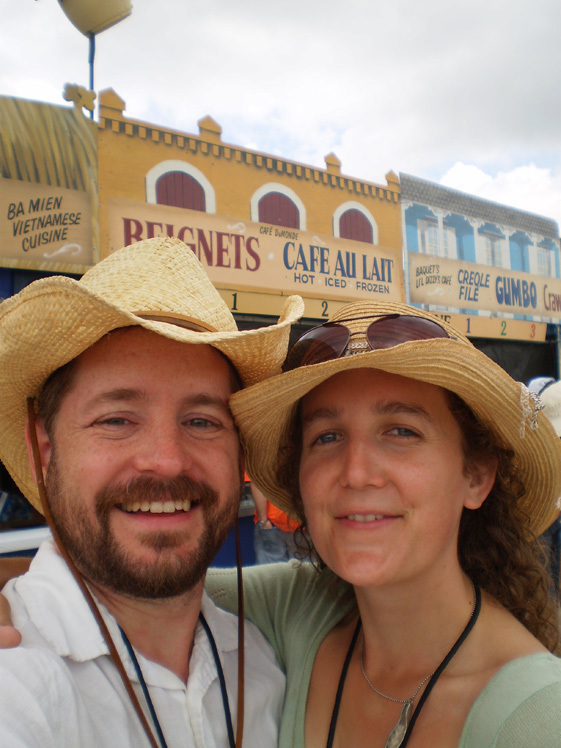 Jazz Fest is of course, amazing, and so is the food there! I’ve been working on a new page, for you and for me. It’s full of all the places (mainly restaurants) that I want to remember from our travels. How do you persuade me to leave my comfortable and productive studio, and head out on the road for a summer tour of art shows? Well, just remind me that when we get to Austin, we can eat at Enoteca Vespaio, they have the first and best macarons I have ever tasted. Then once we get to St Louis there’s Shu Feng, oh the crispy eggplant . . . you get the idea. And it pretty much works that way, every spring. Ever since we read Walking and Eating in Tuscany and Umbria, we have an ongoing joke about being on the walking and eating tour of wherever we happen to be, with the goal of walking enough so that we can eat some more! The list of restaurants and fun places to visit is getting too long to keep just in my head, or on random scraps of paper and lists on my phone, so I made a page for it here. For every place I’ve remembered, looked up, and put on the list, I thought of at least one more that I haven’t had time to post yet. So, look for another update, hopefully soon, and I even have some pictures to put in! But I wanted to go ahead and publish the start of the list. My goal is to keep updating it as time goes on, and we stumble on more hidden gems of the road. If you have some of your own to share, let me know! I’ve been working on this post for a while (um, understatement). I keep feeling like I should, or would at least like to, explain a little more about what we do and why it is that I travel so much, but it turns out to be not so easy to explain. Everything from how I met my husband and fell in love, to the story of my own life and work so far, to the state of the art market (we’re not getting into that one here) is wrapped up in it, and just figuring out what to put in and what to leave out has been more difficult than I thought, but here we go. 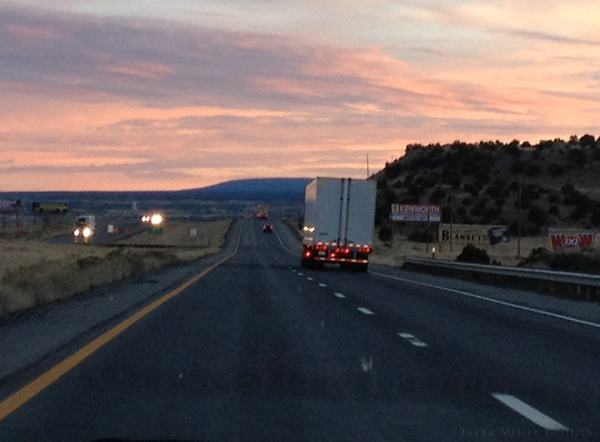 View from the truck windshield—a beautiful sunset from I-40. The beginning of the story, for the purposes of this post anyway, is 2000, when Bryan (long before he was my husband or had this work) left his career as a business consultant. He didn’t like what he saw himself becoming—that guy in a suit who cuts off little old ladies on his way to the airport. He looked at the senior managers at his company and saw that while they were paid generously, they didn’t seem happy. They were still overworked and stressed out. Most of them had been divorced. They spent their careers working to help huge companies with questionable ethical and environmental records. He wanted more time off, and to have some choice of his clients, neither of which the company wanted to give him. He followed his heart and resigned. Bryan wasn’t sure what he would end up doing next. He was a passionate photographer, capturing America’s wilderness using large format film (he still does). To make the next part of the story short, over the following few years he carved out a niche that would allow him to make a living. By the time I met him, in 2003, he was traveling most of each summer, exhibiting his work and photographing for new projects, and spending his winters in Flagstaff, Arizona, where I grew up. Meanwhile, I wasn’t quite sure what to do with myself. I had left school at the University of Arizona (in Tucson), feeling unfulfilled, uninspired, and lonely, and moved back home to Flagstaff in December of that year. I worked at a small museum in town (cataloguing lots of beautiful artifacts) and at a couple of other places off and on, but nothing that was going to turn into a career. Bryan and I met at the end of that summer, started dating and (um, more long story getting short here) fell in love from fall through winter. By the time he asked me if I wanted to travel with him the following summer, I was ready to say yes. It was a big leap of faith, actually bigger looking back on it than it seemed at the time, but I knew he was the one for me, and it worked out. We survived some big adventures together that first time on the road (some that I question whether I would stick around if they happened today), but we made a good team. By the time we got back home in the fall, Bryan had decided that I was the one too. We got married in October 2005, and we still travel together every year. 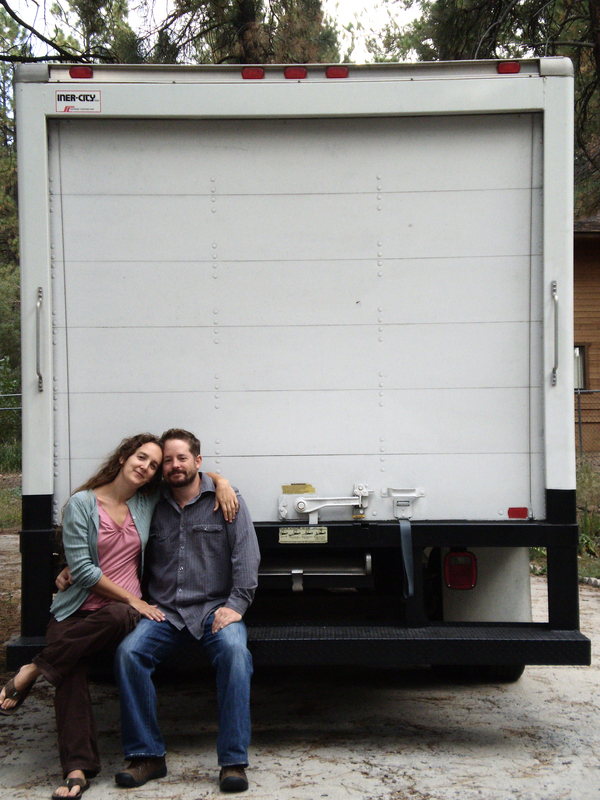 The truck—hauling, transport, mobile studio and camper. Our time on the road is a mixture of selling work, making new work, and of course the adventures that happen in between. 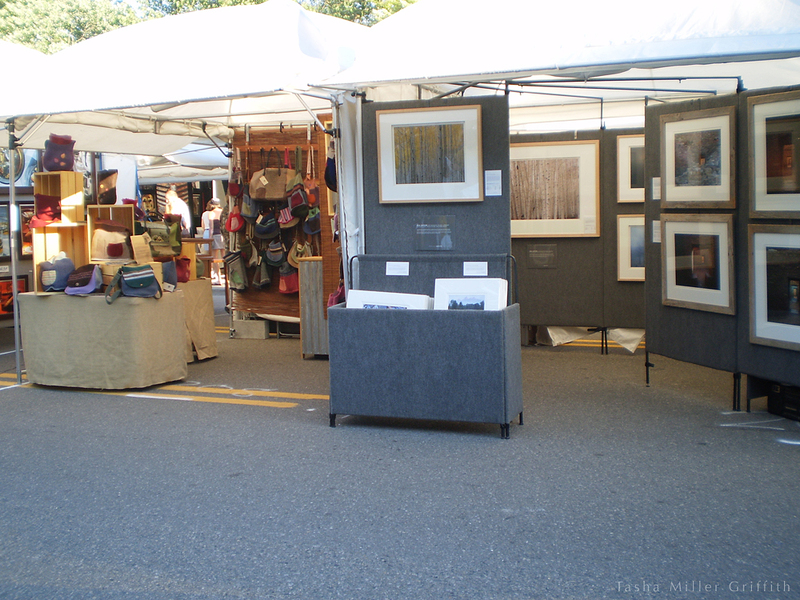 Most of the selling takes place at the country’s top juried art fairs, and at galleries. The fairs are competitive events run by neighborhoods and art associations. Each season it’s a logistical challenge for Bryan to come up with a national tour from the shows and gallery openings he is invited to that will sustain our work. Most of these art fairs take place outdoors. As well as art and workspace and some regular living stuff, our truck holds a tent and carpeted walls to make a kind of mini-gallery for the photos, which we set up and take down every weekend that we “bring art to the people.” Dealing with the weather is also a major part of this experience. I started a list of things never to take for granted, but everything else pales in comparison to the first two items: hot showers and ice. 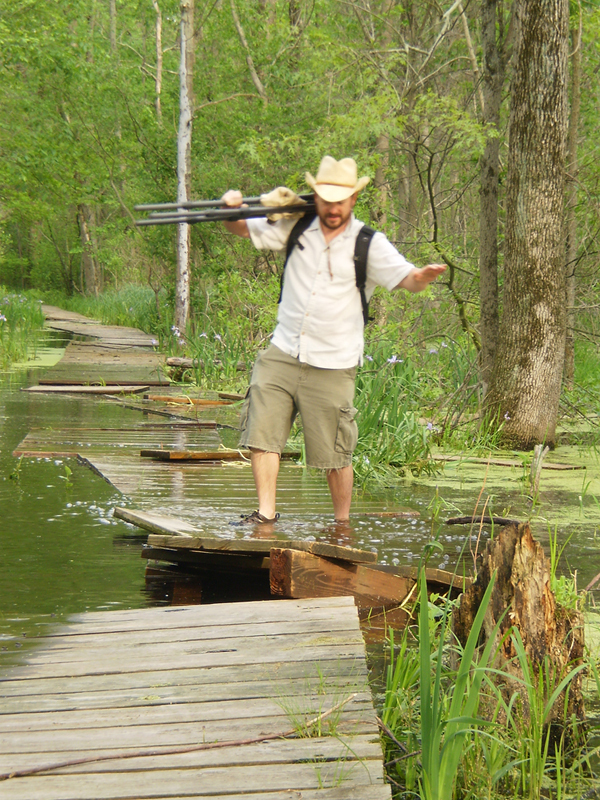 Wherever we end up, there are usually interesting things to photograph nearby. It might be a national park, or interesting architecture for the In a Big World Wandering series, or something for an entirely new project. Don’t worry, he made it to the other side without falling in. In between selling and shooting photos, we usually either camp out or visit friends and family. I love camping, staying in beautiful places, and trying out local foods at farm stands and restaurants. But few things make me more suddenly grateful than arriving at a real house full of friendly faces, running water, a large bed with clean sheets, laundry, and a kitchen, etc. My fingers start to itch at the thought of real kitchen tools, and we usually end up cooking a lot for whomever we’re staying with, as part of our efforts to at least act like, if not actually be, the world’s best houseguests. It’s a good survival strategy; we need to make sure we can always come back. As you might imagine, doing work of my own during this traveling time is . . . difficult. But I’ve also found that it’s fairly necessary to my happiness. I’ve tried selling my own work at art fairs, mainly felted handbags (you can see a few of them on Etsy), but that market wasn’t quite right for the things I made. Along with the usual issues of customers not understanding the cost of handmade goods, plus the physical work to set up an extra display every weekend, it all convinced me that this wasn’t the way to go (at least not with the bags). I did learn a lot though, about all aspects of running an itty-bitty handmade business, and about myself. I began to figure out that my passion is really more for empowering other people to become makers than for selling things I make, hence my latest project (and this blog). Although come fall, I will be making a about a ton of those little fuzzy hats again . . .
Left to right: my booth, and Bryan’s. But back to the road. Being gone for long stretches, usually months at a time, of course makes me homesick. I miss my friends, my family, the smell of the pine forest, my studio (especially my studio—the freedom to make pretty much whatever I want, whenever I want to), my kitchen, green chile, good tacos (depending on where in the world we are) . . . but I’m starting to adapt. At this point, if we stopped traveling, I know I would miss that too. I’d miss the friends and family scattered around the country that we get to spend time with, the foods we get to eat (yeah, I’m a little obsessed with the food) and the things we discover, especially when we can get off the interstate and explore. It’s an amazingly diverse and interesting country out there. At the end of a mediocre show, we’ll often look at each other and say, “Well, we lived.” It occurred to me recently that what we mean is not just “we survived” but also “we’re living” in the fullest way, taking advantage of the paths and adventures that are available to us, even though not all of them are good, and testing our limits. It’s not always fun, pretty much never glamorous, and as a friend who’s taking a sabbatical from art fairs recently put it “a stupid way to make a living.” And yet, one thing we don’t have to worry about is regret about chances not taken and roads untraveled. The odd and beautiful parts of life on the road, the magical things that happen when you’re in a strange place at a strange time, are what will keep me coming back, probably for as long as this weird way of life is possible for us. 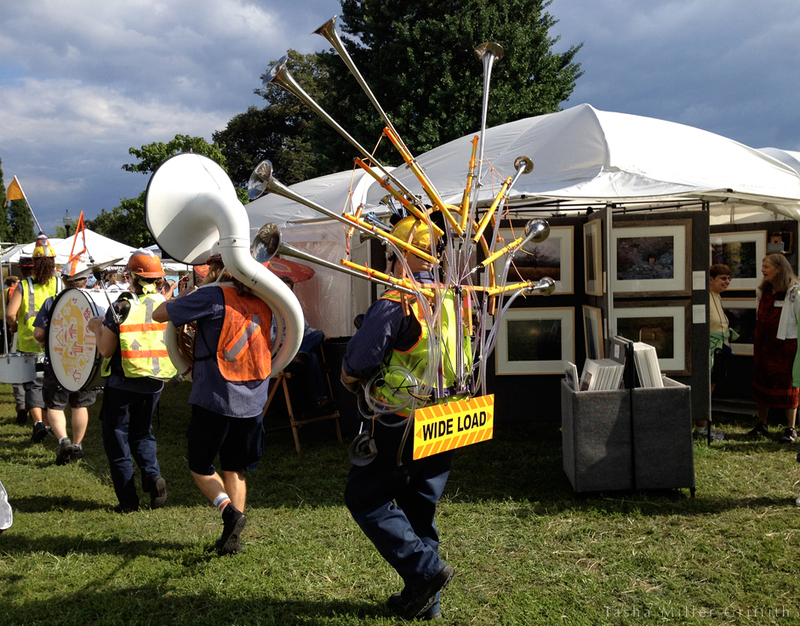 A performance called (I am not making this up) Squonk Opera passing by the booth in Pittsburgh. Now I feel like maybe I should have written this post right at the beginning, as a brief summary of the state of my recent life . . . but here it is. This won’t become a blog all about life on the road (that’s not my thing), but I would like to bring up a few other ways that my own goals and work intersect our travels, and hopefully after this it will make more sense. What about you, any thoughts about travel/work/life?